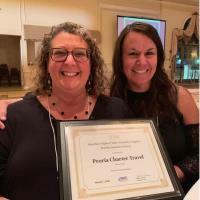 Peoria Charter Travel was recently honored for its sales achievement in 2018, among 220 travel agency members of the MAST Travel Network, at an awards ceremony held recently in Addison, Illinois. Peoria Charter Travel was a recipient of three MAST AWARDS for highest sales in 2018 with 45 nationally-known tour and cruise companies. Contributing to the success of Peoria Charter Travel, is the agency’s commitment in providing superior customer satisfaction, and expert vacation planning. The selection of like-minded travel suppliers entrusted with the agency’s clients, ensures that Peoria Charter Travel continues to be a thriving business in the community. 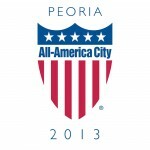 This prestigious recognition ranks Peoria Charter Travel among the top 15 percent of travel agencies in the MAST Travel Network, a sales and marketing organization comprised of travel agencies and suppliers known for exceptional customer service and quality.